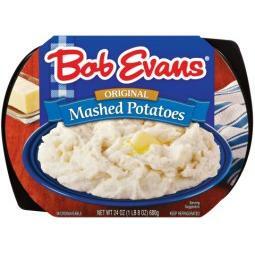 Love all the Bob Evans products...great thick mashed potatoes that taste just like they would if I made them at home. My kids love Bob Evans potatoes! They say it tastes almost like my homemade potatoes! This is such an easy side dish to make in about five minutes. All you have to do is put it in the microwave. I purchase Bob Evans potatoes when we eat a Rotisserie chicken or meatloaf and I'm too tired to make homemade potatoes. Delicious. Much better than instant mashed potatoes. Convenient when you don't have tome for mashed potatoes from scratch. Very simple to cook and has a perfect buttery flavor and texture. I love all bob evans products. these mashed potatoes are awesome!!! Not really the best I've had...just so-so. Don't waste your time. I prefer homemade but for quick addition to a meal these are great.